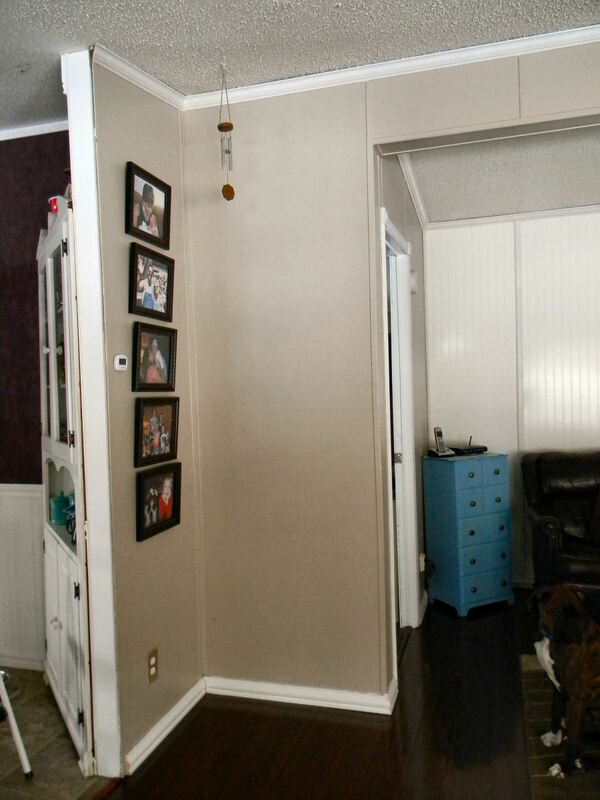 Do you have a space…that space…one that just screams “Do something with me!” in your home? Well, we do. And I have been eying that little nook for about 2 years wishing I could think of what to do with it to make it useful, attractive, and maybe even functional in the process. It’s just a little corner. You step out of the kitchen, there it is. Step out of our bedroom, there it is. But it’s too small to put anything there. We’ve tried putting a bookcase there, but it just looks awkward and is just a repository for a bunch of old books we never read anymore, and pictures, and knick knacks that collect dust. We tried putting various chairs there, but it’s just not really big enough for that and we would always round the corner coming out of our bedroom and stub our toe. Then we just started putting the vacuum there because we have two large dogs who shed a lot and we vacuum incessantly and we’re just too lazy to put it away. But, alas, that doesn’t really add to the “look” we are trying to achieve. So, in one afternoon we painted the corner (as well as the rest of the walls we needed to paint), and put up the shelves to remake this corner into something spectacular. I have to say that the paint we used was fantastic. We have never found a paint that we like as well as this. We used Valspar Paint with Primer in it. This can be purchased at Lowe’s for about $30.00 per gallon. I must tell you that it is definitely a ONE COAT paint. And I slathered that paint on with no rhyme or reason while the ceiling fan was on, blowing air all around the paint, and when it dried it dried completely smooth without streaking. I also use a great brush we have found at Lowe’s, but they may have them at Home Depot as well. It’s a soft bristle brush for paint that has a rubber handle. It’s a short brush intended for corners. The bristles are cut at an angle and I DID NOT HAVE TO TAPE A SINGLE WALL and the edging looks fantastic. This type of brush gives you a lot of control, even with a bit of a shaky hand. You can almost hold it like a pencil. 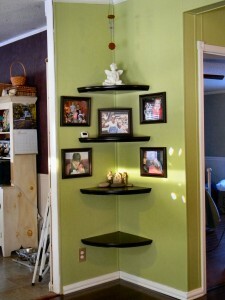 The shelves were purchased at Home Depot for $26.00 a piece. We purchased 4 of them, plus the gallon of paint and two brushes. 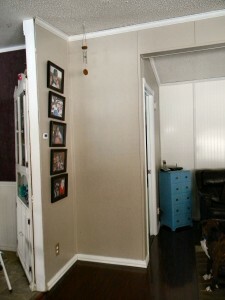 To repaint the living room and to transform this corner, it cost us less than $150 and one afternoon. Now our room has gone from dé-bore to décor in one afternoon! After finishing the corner, we painted a bit more to see how we liked the color in the rest of the room. It’s very green. What do you think? I love how lush it looks with the cappuccino colored shelves and bookcase. Just the look I was going for. In what ways have you transformed your spaces? Take a moment to share in our comments, link to pictures you have posted on the Web, or take a moment to join our site and post your project to our forum. 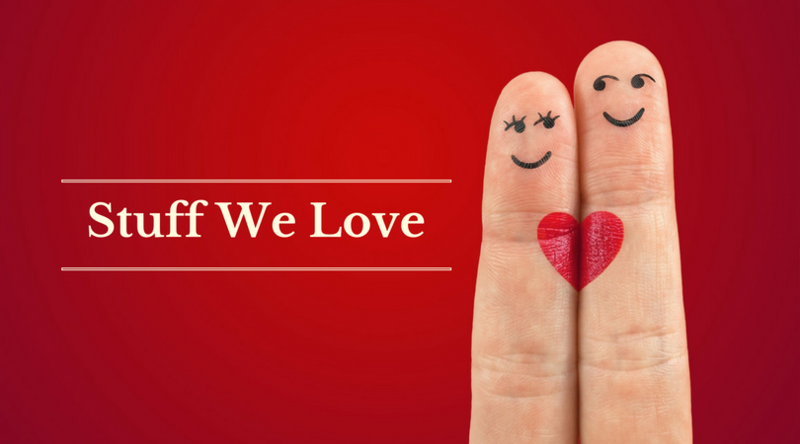 We LOVE to see what others are doing! It’s Spring y’all. And Mother Nature is being slow about freshening up the place. Take it upon yourselves to make your space fresh in easy and inexpensive ways. I liked this designs a lot, specifically the last design I think it's the most beautiful one, keep going. Love all the makeovers you are doing! I am so happy to FINALLY find a page that is for mobile homes. We have a 1979 (older than dirt but not as old as me! hahaha! 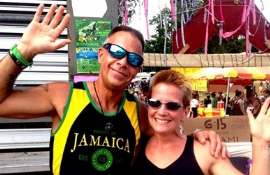 )double wide modular which hubby says is different than a mobile home…but to me…they are pretty much the same. We have lived here for 17 years and I still like it. It does however need a lot of updating, paint, etc. We bought paint for the outside last fall and never got a chance to paint it. As soon as spring gets here…that will be done. I have painted the interior a few times…all the way thru. I need to try to update these old bathroom cabinets that still are orange on the top, lol. This old home is still pretty and the bones are still good. Anyway… I plan on coming here lots! Thanks for doing this work and making videos while you do it. That will help bunches! Nice project. What color green did you use? Hi Sharon. Thanks for commenting! I am pretty sure that color was Valspar "Fresh Green". I loved the color. It was so bright and lively! I was wondering how you put the shelves up on the wall? They were quick and easy to put up and pretty sturdy. I love them! And they add a nice interesting focal point to a room with an odd corner like we have ours in. We got ours at Home Depot for about 28.00, and similar ones are available at Target for around 25.00. 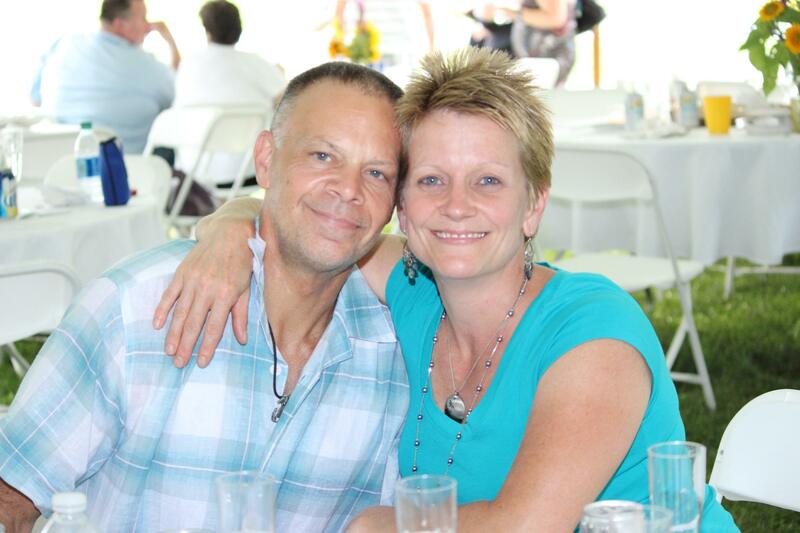 Thanks for visiting and commenting Rene! 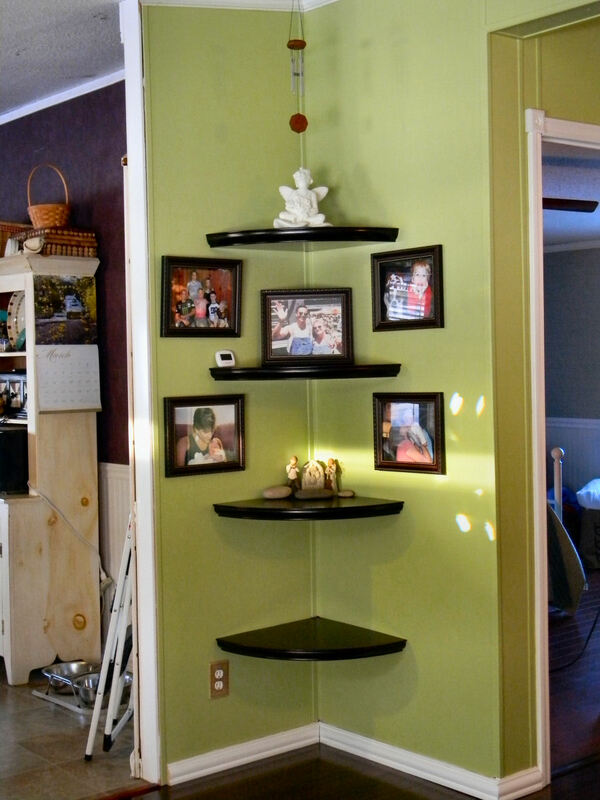 The corner was done with individual shelves found at Lowes and the book case is an Expedit shelving unit from IKEA. How great to see this as I also live in a mobile home. I don’t have a corner like that but I sure have lots of other spaces that need a little fixing up and one being my kitchen at the moment. I have also used Valspar paint and loved it and it is going to be getting used in another month when I start doing a bedroom makeover. Welcome to MyMobilehomeMakeover.com Eleanor, and thank you for commenting. We've changed our living room a lot since that picture was taken, but we have kept those corner shelves just the same. It's the perfect way to use that weird little space. And there are often such weird little spaces like this in mobile homes! Good luck with your bedroom makeover. I love having a new look in the bedroom! Paint can really change the feel of a whole space! Unique idea you have done here. I might try this in our house. We have also a corner in our living room that has the same space as that. I'm just thinking of what color would I would paint in the wall. Thank you for visiting and for commenting. 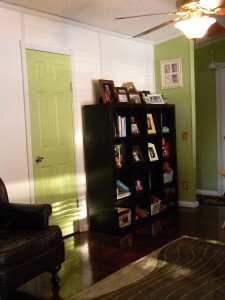 We loved the green color we put on the walls during this remodel. It looked so lush and lively! Good luck with your projects and Happy Remodeling! Great designs! You have very good collection for furniture design. Thanks for sharing such a good collections.